Make beautiful slip on shoes with turquoise no tie elastic flat shoelaces. With a color that you don't see every day and a convenience that makes every day a pleasure, turquoise no tie elastic flat shoelaces are ready to change the way you think about footwear. No longer do you need to look for slip ons to save yourself from tying and untying multiple times per day. You won't need to bend down to tie your own shoes or the shoes of the person you might be buying these for. Slide these into any size or type of shoe, adjust them quickly and easily, then lock them into place and you're out the door. Easily installed into sizes for both children and adults. We don't sell one-size-fits-all products unless it makes sense. 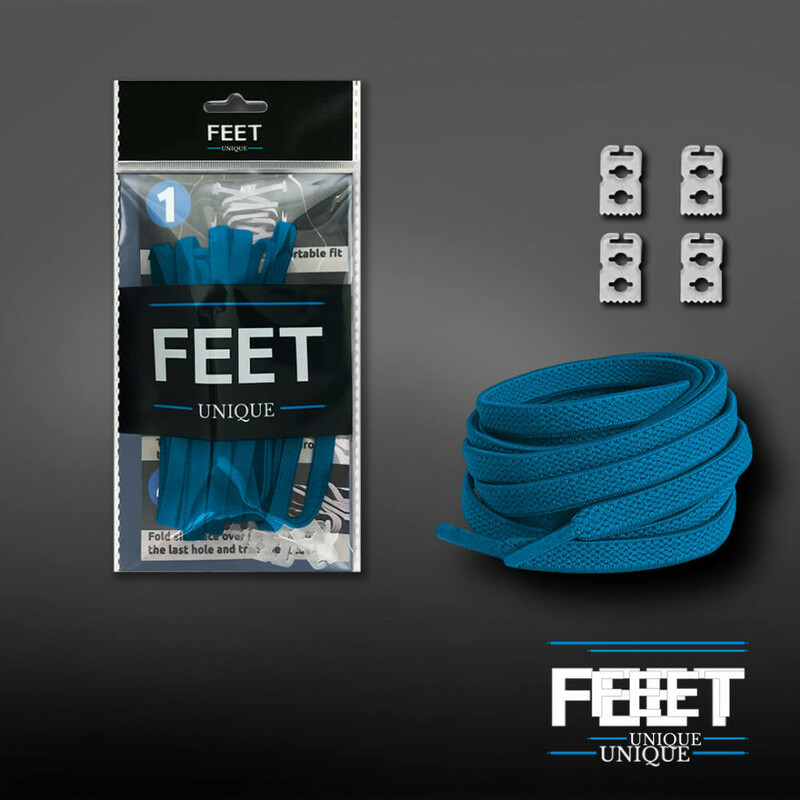 Part of the beauty of no tie elastic laces is how they can stretch by 130% so that everyone can tighten their shoes to exactly how they like it. If we sold specific sizes, two people with the same size foot might need different lengths. By sending extra-long laces to everyone, it's as easy as threading them into your shoe, then trimming the excess lace. Enjoy durability that outlasts the shoes. Once you have your perfect fit, don't be afraid to simply transfer the laces into your next pair of shoes. Elastic flat shoelaces are incredibly easy to clean and don't wear out like fabric laces, nor do they fray or get tangled. Whether a high-contact athlete or you're taking them with you on a relaxing vacation, they'll never let you down, and you can use the same laces in different shoes again and again. Have your ideal style in your favorite color. The color of the shoelaces in a combination of turquoise and blue. It's a great color choice if for no other reason than it's exciting and unique! That's why turquoise-blue elastic flat shoelaces can really make a plainer pair of shoes more stylish.